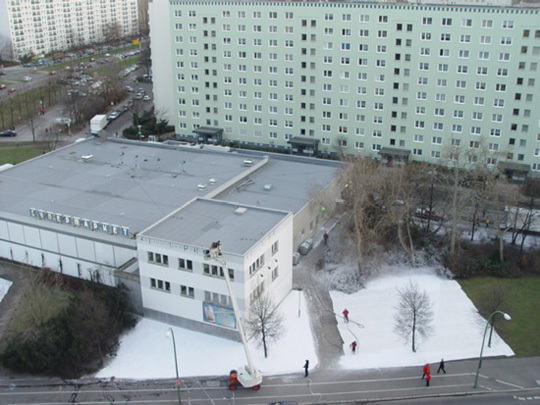 Unitednationsplaza was a temporary, experimental school in Berlin, initiated by Anton Vidokle following the cancellation of Manifesta 6 on Cyprus, in 2006. Developed in collaboration with Boris Groys, Liam Gillick, Hatasha Sadr Haghighian, Nikolaus Hirsch, Martha Rosler, Walid Raad, Jalal Toufic and Tirdad Zolghadr, the project traveled to Mexico City (2008) and, eventually, to New York City under the name Night School (2008-2009) at the New Museum. 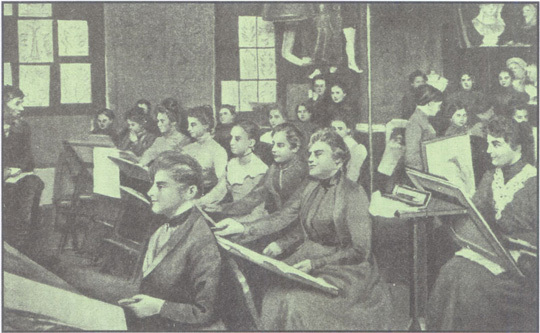 Its program was organized around a number of public seminars, most of which are now available in their entirety in the online archive. The project ‘We are not ducks on a pond...‘ deals with different aspects of the notions of informality, chaos vs. order, correction and community. A small, grassroots collective will attempt to discuss and summarise these topics from their point of view within the frame of the circumstances, efforts, experiences and also intangible structures that have appeared during the past 5 years in Hungary. An important activity that I did at that time was getting together with my “punk” philosopher and a writer friend and we put on a series of so-called “Fast Culture” events in which we would sit on a little stage of a sort of an evening university in three, and just start to talk freely as we would be alone. Sivan vs. Finkielkraut - Cabinet magazin re-enactment of the trial at Documenta 12 "magazine projects"
As a participant of Documenta's "magazines project," Cabinet was invited to mount a one-day event at Documenta. 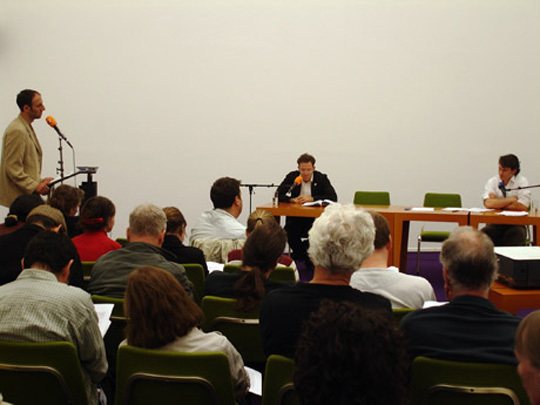 Our event, which took place on 8 September 2007, was dedicated to re-examining Israeli filmmaker Eyal Sivan's libel suit against French philosophopher Alain Finkielkraut. This trial, which occured in Paris in 23 May 2006, was translated and published in Cabinet no. 26 with an introduction by Thomas Keenan and Eyal Weizman. The Travelling Drawing School is series of events, based on education and community-building. Its’ first stage and debut will be on the Gallery Night 2010. In the mornings called upon artists and experts will hold „drawing lessons” on the line of previously decided topics, at the evenings the results of these classes will be exhibited. The participants of these special lessons will be high-school students, who formerly applied for the project. The aim of these lessons is not to teach them how to draw, but to promote a tangible communication with the help of drawing. The imprint of these communication-experiments will be shown on the exhibitions, where the visitors can have an insight of the workshop-situations and take part in a fresh and dynamic exhibition of the newly made works. Apart from these, the alternative ways of teaching and the educational methods of the artists will be visible through the exhibited drawings. Thus the educator artists and experts are behaving only as a leader or a helper: with their topics and ideas they create the situation for the Drawers and ensure the frame of the work. 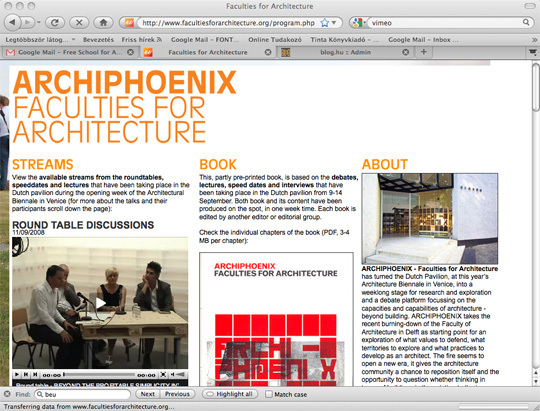 ARCHIPHOENIX - Faculties for Architecture has turned the Dutch Pavilion, at this year’s Architecture Biennale in Venice, into a weeklong stage for research and exploration and a debate platform focussing on the capacities and capabilities of architecture - beyond building. ARCHIPHOENIX takes the recent burning-down of the Faculty of Architecture in Delft as starting point for an exploration of what values to defend, what territories to explore and what practices to develop as an architect. The fire seems to open a new era, it gives the architecture community a chance to reposition itself and the opportunity to question whether thinking in terms of buildings is the solution to the issues and demands that we face in the near future. 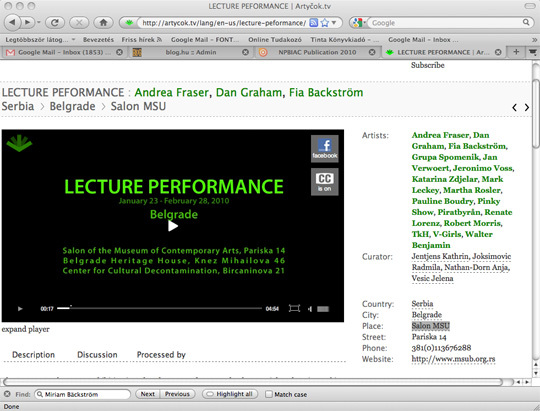 In short: the faculties for architecture, in the sense of its multiple capacities, powers, capabilities. A question mark rather than an exclamation mark. asztaltársaság / table society from leonor botev on Vimeo. What are we talking about, and what are we pass over in silence in a gallery where there is no exhibition? There are only chairs to sit down – and speak or not to speak. Our project aims to get a sight of what happens nowadays when several dozen hungarian people sits down and begins to talk about which they here-and-now interested in. Erika Baglyas interprets the possibility of an one-mounth-exhibition at the Óbudai Társaskör Gallery as a sequence of events. The conception – which is the result of the shared thinking of three friends – entails four fixed elements. First, the exhibition can be visited only at specified times. 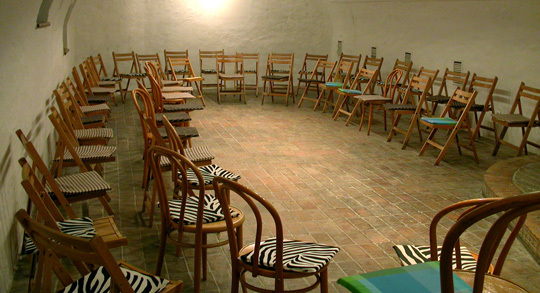 Second, the gallery room chairs should be placed in concentric circles to sit down. 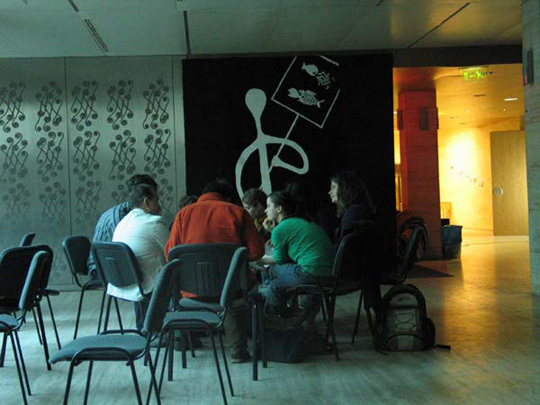 Third, two group leaders are present during the meetings. Fourth, we consider the project's content and message which is displayed at the exhibition’s room during the four-time course. Anatomy of a Street is an on-going research project portraying epicenters of accelerated urban transformations: a comparative investigation of ‘high streets’ from Warsaw, Bratislava, Pécs, Budapest and Paddigton (London). AUBERGINE:NW8 from Giv Parvaneh on Vimeo. The fifth installment of MoMA’s Performance Exhibition Series is the North American premiere of Mark Leckey’s (British, b. 1964) performance-based work Mark Leckey in the Long Tail (2009). 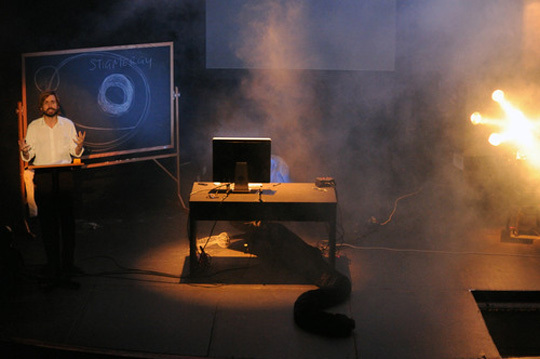 Part lecture, part monologue, and part living sculpture, the work traverses the history of television and broadcasting, incorporating the role of the BBC (British Broadcasting Corporation) and the icon of Felix the Cat, while simultaneously addressing the “long tail” theory of internet-based economics. For the performance, Leckey lectures from inside an installation, which employs a revolving stage that hovers between film set and sculpture. The exhibition will be performed live three times on October 1, 2, and 3 at The Abrons Arts Center in New York City. HOMEWORK is a collaboration between artists Ditte Lyngkaer Pedersen, Carlos Motta, Lize Mogel, and Jeuno J.E Kim. Conceived as a study group, an editorial team and a curatorial collaborative, HOMEWORK investigates relationships between art and “the political”, education and politics, process and product. 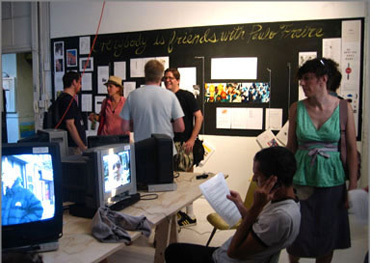 The Classroom at PS122 is a space traditionally used for solo exhibitions. In a sense, this was a “solo show” of Paulo Freire. It was not directly biographical, but rather associative. 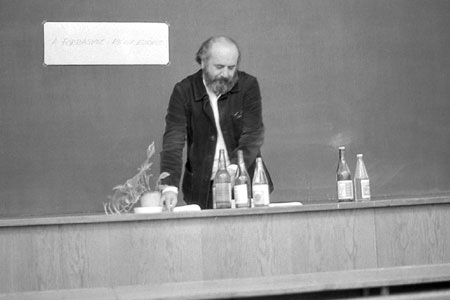 Freire’s writing is highly influential to artists, especially to those who work in pedagogical or dialogical form. 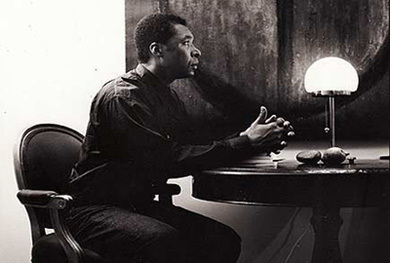 HOMEWORK wanted to see where this influence lay, and how his work, considered radical in the 1970s when much of it was written, resonates in today’s world. 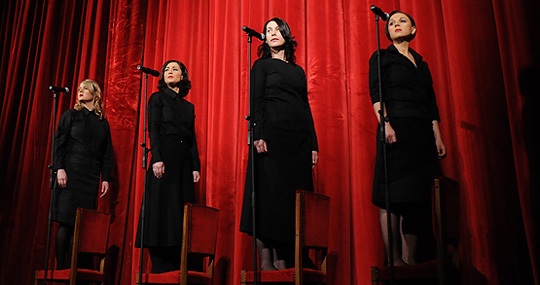 Ivet Ćurlin, Ana Dević, Nataša Ilić and Sabina Sabolović , the curatorial group of WHW /(What, How and for Whom) announced the biennial’s conceptual framework during a live performance in November 2009. With his team of six co-curators from six different countries, artistic director Okwui Enwezor, the first not to have come from Europe, demonstrated an open-minded and truly international approach to the world for Documenta11. As envisaged in the original concept they invited artists to Kassel from countries that had never been represented there before, to make a unified international experience of the documenta as an exhibition of world art in a stage of global post-colonialism. New York artist Andrea Fraser is best known for her series of "gallery talks"—enactments that highlight gender and class relations inherent in the structures and histories of art organizations. 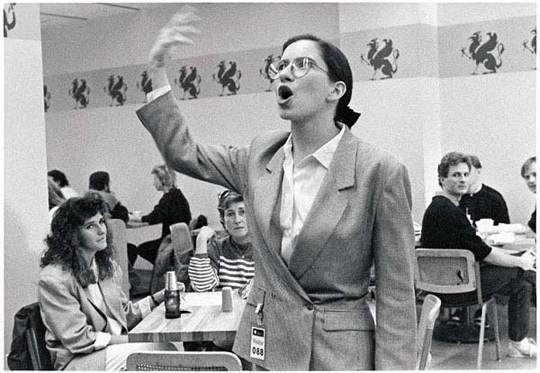 In 1989, the Philadelphia Museum of Art invited Fraser to perform Museum Highlights: A Gallery Talk, a tour in which she adopted the fictional persona of a docent named Jane Castleton. Visitors gathered in the Museum’s West Entrance on five designated days, waiting for the scheduled "Contemporary Viewpoints Artist Lecture by Andrea Fraser" or for one of the Museum's numerous docent-led tours. Castleton arrived instead, ready to talk to anyone who would listen. She led these unsuspecting visitors on tours of not only the galleries, but also the restrooms, Museum Store, and cafeteria. In addition to talking about art, she discussed topics such as corporate and private sponsorship. 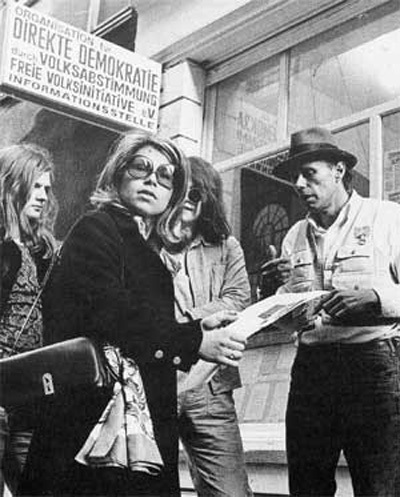 Joseph Beuys - “Organization for Direct Democracy by Referendum” to initiate conversations on a range of topics including politics and art. 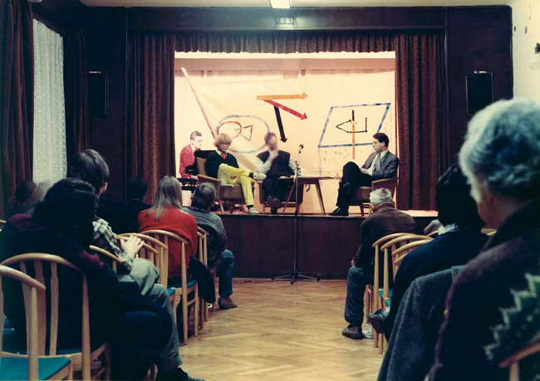 The discussion forum "100 days – 100 guests" at Documenta X (1997, curated by Catherine David), which hosted 100 talks during the exhibition, and to the four Documenta discussion platforms across the globe prior to the opening of Documenta XI (2002, curated by Okwui Enwezor et al. ).